Quercetin-A flavonoid found in the skin of apples and onions quercetin is an effective mast cell stabilizer (Mast cells are the cells responsible for histamine release and the symptoms associated with allergies)(1). It binds to the outer membrane of mast cells and prevents them from releasing histamine(2). It also helps to modulate the immune system by helping to lower the inflammatory TH-2 allergic response. There are several forms of quercetin available for supplementation. 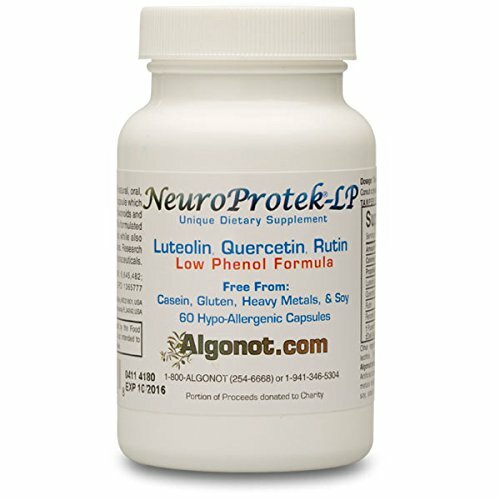 The Alpha-Glycosyl Isoquercitrin form has 3 times the bioavailability of isoquercetin alone and nearly 18 times the bioavailability of quercetin aglycone. Because it is actively and rapidly absorbed, Alpha-Glycosyl Isoquercitrin reaches peak plasma levels within 15 minutes acting very much like a pharmaceutical anti-histamine(3). Probably my top supplement for allergy support. It works like a natural pharmaceutical anti-histamine like Claritin, for many of my patients. Typical starting doses are 2-3 caps 3-4 times per day as needed during Allergy season. Stinging Nettles-A herbaceous, perennial, flowering, plant originally native to Europe but now also found all throughout the US Stinging nettles have hollow stinging hairs called trichomes on the leaves and stems, which act like hypodermic needles, injecting histamine and other chemicals that produce a stinging sensation. When freeze dried and used as a medicinal herb for allergy and asthma symptoms several studies have shown that Stinging nettles are great at relieving symptoms associated with these conditions. Vitamin C-Large scale intravenous vitamin C (7.5 grams) studies have shown a significant anti-histamine effect for allergic symptoms(5). For oral doses 2 grams per day is an effective starting dose(6). Vitamin C can cause loose stools and acid reflux in people who are prone to it so you should be careful with dosing too high and always consult with your doctor. Buffered vitamin C is more well absorbed than non-buffered. Too much vitamin C can lead to loose stools so you want to be careful not to overdose. Typical oral starting dose is 2 grams per day so 2 caps. Luteolin-A common flavonoid in many fruits, vegetables, and medicinal herbs. High in artichokes. Works to stabilize mast cells and prevent them from releasing histamine(8). In mice studies luteolin was effective at reducing allergic immune response(9). Bromelain-A natural flavonoid found in pineapples, papayas, mangoes, honey, bananas, avocados, sauerkraut, kimchi, miso, kiwifruit and ginger. Bromelain is a complex mixture of protease extracted from the fruit or stem of the pineapple plant(10). A powerful combination anti-inflammatory with Bromelain, Curcumin and Quercetin. BCQ combines the healing power of all 3 allergy busting ingredients into one pill. It is also great for other inflammatory conditions of the body. Typical starting doses are 3 caps once per day. NAC-N-acetyl cysteine (NAC) is powerful antiodant and free radical scavenger. It helps to lower inflammation in the body in general and is a precursor to glutathione production (our body’s main internal anti-oxidant). NAC can help with many of the respiratory symptoms associated with asthma as it helps lower inflammation in the bronchial passages. NAC is also beneficial for asthma(11). Typical starting doses are between 600-1200mg per day, occasionally more in more acute cases. Pure Encapsulations is one of the best brands on the market with the highest quality third party tested ingredients. Typical starting dose is 600-1200mg per day (1-2 caps). Air Filter-Having an air filter in your home is crucial for removing pollen, dander, mold and dust from your environment. By removing or mitigating these triggers you can lessen the allergic response these allergens have on your system. The mercedes benz of air purifiers the Dyson air purifier pulls 99. 97% of allergens as small as 0. 3 microns making this an ideal air purifier for allergies, dander, dust, pollen and mold spores. Neti-pot/ Sinus rinse-This is a great way to rinse out and remove accumulation of allergens from the sinuses. Make sure to always use sterile, saline water in your neti pot. NeilMed Sinus Rinse is an easy squeeze bottle system that allows you to deliver the saline solution with positive pressure to clean the nasal passages thoroughly, while maintaining your head in an upright position. Local Honey-Although no concrete evidence exists to support its use, many people use local honey as a type of immunotherapy for their allergy symptoms. Local honey contains the allergens and pollen of a given area in low doses and is thought to potentially create a low level immune modulation response where the body develops resistance to the allergens over time creating “immune tolerance”. Since the pollen levels are variable in local honey some people can react with anaphylaxis and if you are prone to this you should be very careful when consuming raw honey. One large scale study in Malaysia found that consuming 1g/kg of honey per day for 4 weeks lowered allergy symptoms(7). That is a very high dose and not sustainable for most people. Anecdotally lower levels such as 1 tablespoon 2-3 times per day may also be effective and more sustainable longer term. 1. "Quercetin: Proven Health Benefits, Dosage, and more | Examine.com." 16 Jan. 2014, https://examine.com/supplements/quercetin/. Accessed 8 Apr. 2019. 2. "Quercetin and Its Anti-Allergic Immune Response. - NCBI." 12 May. 2016, https://www.ncbi.nlm.nih.gov/pubmed/27187333. Accessed 8 Apr. 2019. 3. "Evaluating the Bioavailability of Isoquercetin | Natural Medicine Journal." https://www.naturalmedicinejournal.com/journal/2010-01/evaluating-bioavailability-isoquercetin. Accessed 8 Apr. 2019. 4. "Efficacy of Supportive Therapy of Allergic Rhinitis by ... - NCBI - NIH." https://www.ncbi.nlm.nih.gov/pmc/articles/PMC5963652/. Accessed 8 Apr. 2019. 5. "Intravenous vitamin C in the treatment of allergies: an ... - NCBI - NIH." https://www.ncbi.nlm.nih.gov/pmc/articles/PMC6136002/. Accessed 8 Apr. 2019. 6. "Natural Treatment of Perennial Allergic Rhinitis - Foundational ...." http://www.altmedrev.com/archive/publications/5/5/448.pdf. Accessed 8 Apr. 2019. 7. "Ingestion of honey improves the symptoms of allergic rhinitis - NCBI." https://www.ncbi.nlm.nih.gov/pubmed/24188941. Accessed 8 Apr. 2019. 8. "Effects of luteolin and other flavonoids on IgE-mediated allergic ... - NCBI." https://www.ncbi.nlm.nih.gov/pubmed/10705729. Accessed 9 Apr. 2019. 9. "Anti-allergic effect of luteolin in mice with allergic asthma ... - NCBI - NIH." 8 May. 2017, https://www.ncbi.nlm.nih.gov/pmc/articles/PMC5470611/. Accessed 9 Apr. 2019. 10. "Potential role of bromelain in clinical and therapeutic applications - NCBI." 18 Jul. 2016, https://www.ncbi.nlm.nih.gov/pmc/articles/PMC4998156/. Accessed 9 Apr. 2019. 11. "A Review on Various Uses of N-Acetyl Cysteine - NCBI." https://www.ncbi.nlm.nih.gov/pmc/articles/PMC5241507/. Accessed 9 Apr. 2019.